Today I’m featuring a book that I just started reading. Inside the changing room for female staff, I toss soiled scrubs into a biohazard hamper and strip off the rest of my clothes and medical clogs. I wonder if Col. Scarpetta stenciled in black on my locker will be removed the minute I return to New England in the morning. The thought hadn’t entered my mind before now, and it bothers me. A part of me doesn’t want to leave this place. A few years back I devoured this series pretty much back to back. Then I hit a wall where the books just didn’t do it for me anymore and I quit reading them. But the last couple of years I have tried to read at least one book from the series each year. I decided it was time to read another Kay Scarpetta book. I used to read her all the time, but haven’t read one in years. I think I’ve kind of moved on to other things, but I hope you enjoy it! 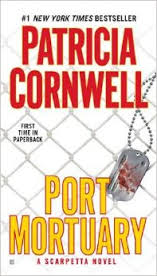 I haven’t read Patricia Cornwell in a while… this sounds good! It’s been years since I last read one of Cornwell’s books. I lost interest in the series and have never gone back. I hope you enjoy this one!